Today is Faith Friday and that means I have another Faith based project to share. 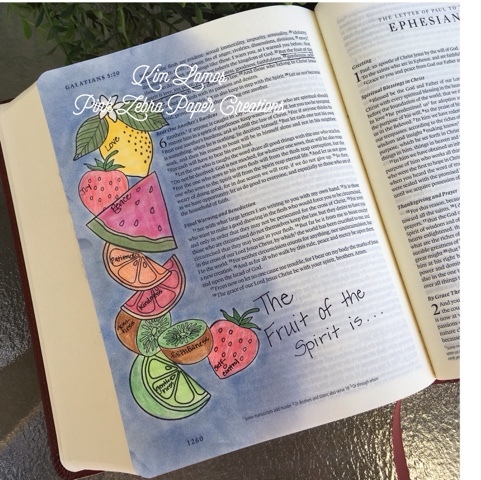 For a few months I have been researching the whole idea of Bible Journaling. I knew I didn't want to do this type of artwork in my regular, everyday study Bible, so I started researching Bibles. I looked at Bibles online and decided which type I would need. I then bought my first journaling Bible. With all that said, I finally bought the Bible and was ready to get started. Not quite yet! Something held me back from actually putting ink on to the pages. I then attended the Fun Stampers Journey Convention and I knew why I had not started yet. Little did I know that the things that Richard had put in the brand new Inspiration Book and Catalog was exactly what I needed. So I used the four sets from the Slice of Life Collection and Black Licorice ink to stamp the fruit. I then used the masking technique to get the fruit to look like they were behind and in front of each other. I used the PanPastels in the Rich Sorbet pallette to create the blue background. I used a combination of colored pencils and PanPastels to color the fruit. 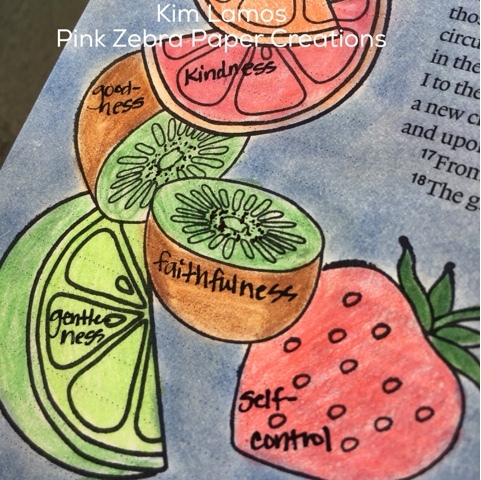 Lastly, I wrote in the Fruits of the Spirit, one on each piece of fruit. I have lots of ideas in my head, so please check back next Friday for another Faith based piece. Enjoy! This is so cute!!! You could sell the Bible when your done it's so cool!! !